Why NEXGADGET Wireless Charging Stand? We selected every component and element carefully, each detail was meticulously designed to ensure the high quality and your perfect experience. 1 stand for all your Apple gadgets. Charge your Apple watch ,iPhone and AirPods at the same time on one stand, hide and organize your charging cables in the base. Organize you Apple Pencil and Airpods,no more worries about losing them. mini-sized charging pad is easy to use and take down from the stand as a portable charger. Low-key, yet fully visible LED light on the back of charging pad turns red or blue to indicate whether it's charging or completed respectively. enhances its stability,high-polished edge protects your devices from scratch. All Qi-enabled smart phone,and non-Qi smart phone with receiver. ring holder or mount metal plat when charging. (Otterbox case must be removed). 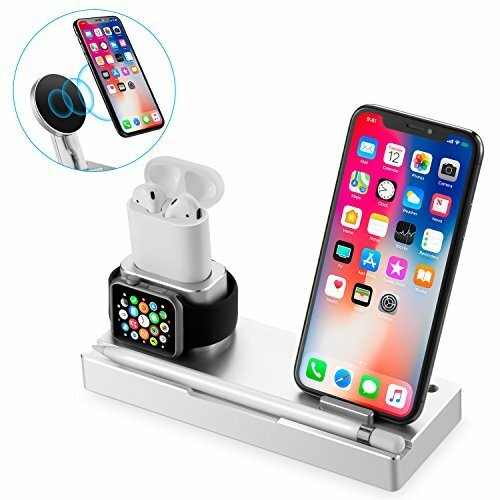 6 in 1 Multi-function: Works as an stand for Apple Watch, AirPods, iPad,Apple Pencil,Wireless Charger and Charging Stand. A must-have to organizing your Apple devices,no more worries about losing your Apple Pencil and Airpods. The best designed angles hold your watch, phone, and AirPods tight and sturdy, and perfectly hides your charging cables in the stand base, keeps your desk neat and tidy. Detachable and Safe: It comes with a detachable and ultra compact wireless charging pad, can be detached from the stand and carry on for charging anywhere. With over-voltage protection, temperature control, foreign object detection. Making your charging more safer and convenient ever. Adjustable Viewing: Charge vertically or horizontally for ideal use by moving the charging pad up and down. Frees your hands for Facetime, tracking of messages, or watching videos, while continuously powers up your devices. Solid and Elegant: Solid enough to hold 12.9" iPad Pro nice and steady. The aluminum stand is optimized to protect your devices from falling down due to gravity,organize your phone, watch,Apple Pencil,iPad and AirPods,and prevent them from scratch. Premium aluminum alloy with refined polishing provides comfortable tactility and elegant appearance. Wide Compatibility: Universal for Apple Watch Series 3/ Series 2/ Series 1/ Nike+ / Sport / Edition / 38mm/ 42mm; Apple AirPods; Apple Pencil;iPad Pro/ Air 2 / Air / mini ,iPhone X / 8 /8 Plus, Samsung Galaxy S9/S8/ Note 8/ S7/ S6 Edge and all Qi enabled devices. If you have any questions about this product by NEXGADGET, contact us by completing and submitting the form below. If you are looking for a specif part number, please include it with your message.